Foreign Minister Mevlut Cavusoglu told reporters on May 25 that his government has reached an agreement with the U.S. "in principle" to provide air support for Syrian rebels. ANKARA — NATO allies Turkey and the US have agreed in principle to provide air support to Syrian rebels fighting the regime of Syria's President Bashar Assad, Turkey's foreign minister said. The planned air support would protect the Syrian opposition fighters who have been trained and equipped by a joint Turkish-US program at a military base in Turkey, Foreign Minister Mevlut Cavusoglu said. Turkey and the US hope to train up to 15,000 rebels. A US diplomat in Ankara did not comment on how soon the air support for the rebels could start. The move marks a departure for Washington from its earlier position in opposing a safe zone for Syrian rebels, observers say. It also could mean broader US involvement in the Syrian conflict. Cavusoglu did not elaborate on what "in principle" meant, what kind of air power would be provided or by whom. "They have to be supported via air. If you do not protect them or provide air support, what is the point?" 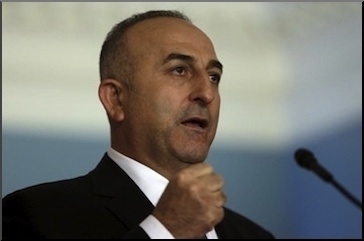 Cavusoglu told reporters in televised remarks. "There is a principle agreement on providing air support. How it is going to be provided is in the responsibility of the army." Although Turkey and the US agree on supporting moderate Islamist forces fighting in Syria, they disagree on who should be the priority target. Turkey insists the rebels should be supported to fight primarily Assad's regime in Damascus while the US thinks the priority enemy is the Islamic State group that has captured large swaths of land in Syria and Iraq since last summer. A senior Turkish diplomat said both enemies could be fought simultaneously if rebels are given sufficient support. "We need not specify in bold letters which enemy is the worse enemy," he said. "The rebel forces can be trained, equipped and supported enough to fight at more than one front."